Below you will find a list of all the Casino Clic bonuses - offered to new players. The right side offers a casino overview (click to scroll through the images). 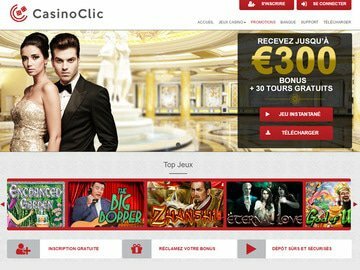 Clic Casino is a new casino offering the opportunity to play world-class casino games to players around the world. This top-rated casino provides a secure environment that is welcoming from the onset with bright, clear images and presentation of its offered games. Licensed in Curacao and established in 2017, Casino Clic focused on attractive players with its superb range of player favourite promotions. With a library that consists of over 200 games from leading software company Realtime Gaming, players can look forward to an extensive selection of progressive jackpot slots, video slots, table games and speciality games like keno, scratch cards, and craps. New players to the casino are enticed with multiple promotions and this begins with two deposit bonuses. The first is a 100% offer up to $200 and the second is 200% up to $100. Joining the first deposit are 30 no deposit free spins on the slot Achilles. To keep a focus on rewards, Clic Casino offers a 50% weekly recharge bonus up to $500 when you enter bonus code WEEKLY50. In addition, every Tuesday offers a cashback bonus of 15% on your losses. Simply email support and your cashback will be credited - no fuss, no hassles. Tournaments are a big part of life at ClicCasino and are offered daily, weekly, as well as monthly. The free daily tournaments offer the chance to share in a $25 prize pool, weekly tournaments are also free and increase the prize pool to a respectable $250 and monthly tournaments offer a $1000 prize pool bringing you over $2750 in free cash opportunities. The game library from RTG is designed to provide a high-energy gaming experience thanks to is high-def graphics, game features, animations and sound effects. Available in both instant play and download versions, the software is compatible with iPad, iPhone, and Android mobile devices. The largest selection of games falls under the video slot category, but where it holds its greatest value is the sheer volume of progressive jackpot slots that encompass the RTG real series slots. It combines brilliant graphics, a broad range of themes, game features and brings them together wonderfully in exciting fashion. Joining the video slot selection, an extensive video poker selection along with table games, and several speciality games complete the gaming library. The mobile casino includes the full RTG line-up of games mentioned above. As an established developer, RTG has ensured its games are fully compatible with most mobile devices and are designed to fit perfectly to the accessing device with controls fitted to make game play easy and trouble free. The mobile casino is accessed via your mobile web browser without the need to download a casino app and using valuable space, and all standard security features are in place to protect personal information. Another fine feature that is standard with Clic Casino is their priority towards privacy and security. This ensures that any transactions taking place between the casino and players are encrypted to protect information being transmitted as deposits and withdrawals are being processed. The banking options, while somewhat limited, are those most used by players. This includes Maestro, MasterCard, Visa and Visa Electron for credit card deposits, Neteller, Skrill for e-wallet deposits and virement bancare for wire transfers. For those in Canada, the best option would be Vanilla Prepaid MasterCard's, which are available at retailers throughout Quebec and the rest of Canada. Support is carried out using multiple contact methods, all provided with the player in mind and staffed by friendly professional agents who are able to assist you with any questions relating to the casino you may have. Available 24 hours a day, the casino can be contacted via email, telephone and live chat. 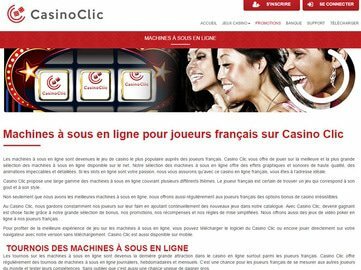 Clic Casino may be a new casino, having only opened in 2017, but it is clear they have a firm mindset on how to operate a casino that is designed for players. The game presentation is excellent and backed by Realtime Gaming. While they may not offer live dealer games or other game categories, those they do provide are action packed and proven to be reliable, which is exactly what you want with an online casino. Forward thinking with their promotions, strong banking options and the support in place makes them a perfect choice for French Canadian players looking for a viable online casino.